A variety of link bracelets, most Native American made with a few vintage costume jewelry and a few Mexican bracelets. 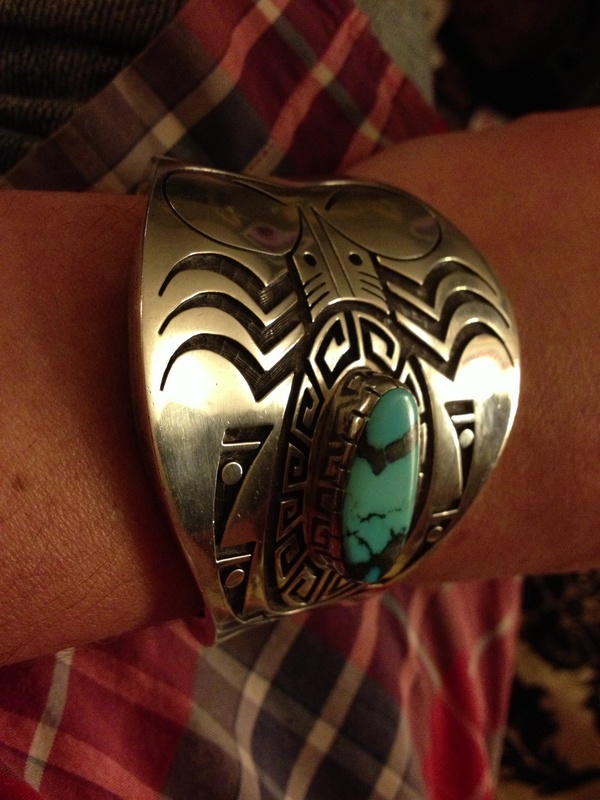 The traditional southwestern Native American bracelet is a cuff bracelet. But a cuff is not for everyone and especially some women, so in response to market demand, along the way, Navajo, Hopi and Zuni artists began making link bracelets. Link bracelets are a great alternative to cuff bracelet – they are light, loose, airy and have a nice movement and feel to them. They are great for summer. And if you are like me and want to wear more than one bracelet at a time, link bracelets make a nice addition on the same wrist as a watch, cuff bracelet or bangle bracelet. 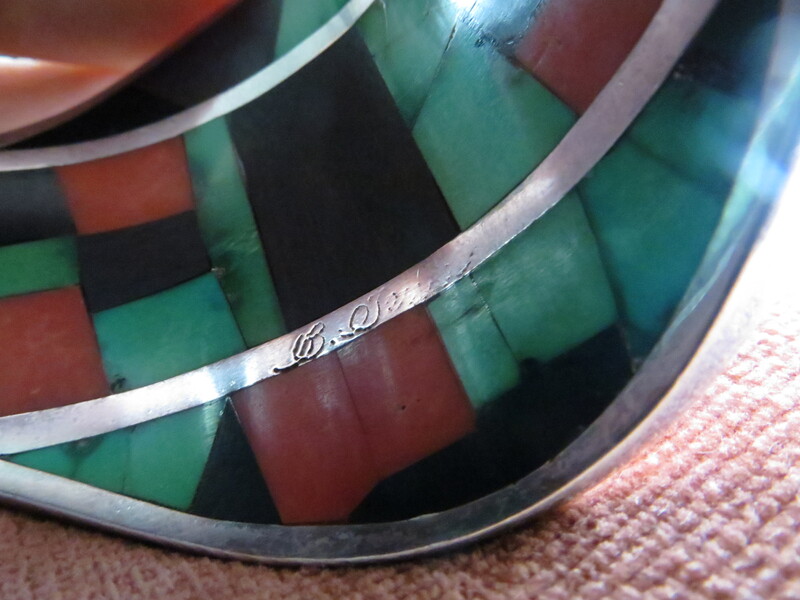 Southwest Native Americans learned the art of silversmithing from plateros, Mexican silversmiths. Therefore I am including some Mexican link bracelets in this group to show various features. The first Native American link bracelets started appearing in the Fred Harvey era and were made of copper. Not all link bracelets are created equal. They take a lot of work to put together. Because they are somewhat “mechanical”, i.e. they have moving parts, either they work well or they don’t. That aim of this article is to point out some of the variables so you can choose the perfect link bracelet. First of all, these are the main styles with materials most commonly used in Native American Link bracelets. SILVER – Sterling Silver Stamped Bead Link Bracelet by Navajo Marie Yazzie. SILVER AND GOLD – 12 K G.F. and STERLING link bracelet with decorative box latch. Next, how are the various panels attached to each other? How do the ends fasten? What are some other features? SAFETY LATCH (KEEPER) – Lapis Link Bracelet stamped 950 (greater silver content than Sterling) with box latch and safety clasp (keeper). Remember, you will be putting a link bracelet on with one hand, so choose one that has a fastener you can easily operate. Although many link bracelets are adjustable, be sure to choose a length that will allow the bracelet to fit like you want – snug in place, loose, or actively moving. I hope that this article has helped you find the missing link in your jewelry collection ! Unique Bracelet has Inlay on the Inside of the Cuff !! Hi Paula, thanks for taking the time to read my email. So I have been an admirer of southwestern jewelry since my early childhood going to flea markets and estate sales with my parents. No that I’m older an can afford to buy some I have begun to develope a small collection of men’s bracelet and rings. While shopping at an estate sale this weekend, I came across LITERALLY the most amazing piece of SW jewelry I have ever seen. Firstly, It is HEAVY (I haven’t weighed it but the band is like a THICK and the cuff is 2 inches wide on the wrist). Secondly there is an engraved geometric insect disign on the top side with a big polished hunk of quality (bisbee?, blue mountain? Turquoise) making up the insects abdomen section. Now the most interesting/unique part is that when you flip the cuff over the inside of the band has an absolutely AMAZING geometric coral/onyx/turquoise/wood inlaid disign occupying the entire inside band. It is signed in old style script (which has been half rub off – by taking it on and off I presume) from what it looks like, it reads B. Jexxxxx … I researched pretty extensively online and can’t find any signatures or really even jewelry examples that are seem very similar to it. I was hoping you could give me some insight, or point my research inthe right direction. So in your opinion, this piece looks to be authentic native american? Contemporary or vintage/antique? I am a newbie to the collecting field and have limited knowledge to things of this quality. I love the piece regardless (it’s just so darn pretty). Also, None of this information you provide will be used to sell this piece – I love it way to much to ever sell it – I bought it has a birthday present to myself, and can say with all honesty, that it makes me happier than just about anything I have ever purchased for myself. Thanks again for taking the time to respond, and for providing a valuable resource to those of us new to collecting Native American Jewelry. Again, thanks so much for taking the time. Your beautiful and unique bracelet is the work of Bobby Tewa (Bobby Darrell, Tewanoitewa) , a San Juan Tewa/Hopi silversmith that began work in 1974. He was a silversmith for Santa Fe Associates Inc. and began using this hallmark in 1980. He was born in 1948 and is an award winning artist of mosaic inlay and overlay. He lives in San Juan Pueblo, New Mexico. His items have won awards, have been exhibited in various markets and books and are in collections, including the Smithsonian National Museum of the American Indian. He learned his craft from the San Juan jewelry program and served in the US Marine Corps. Now that you know the artist’s name you could type in “Bobby Tewa” in google and then click images and you will see more examples of his work plus a few photos of the artist himself. You found a treasure ! Enjoy. 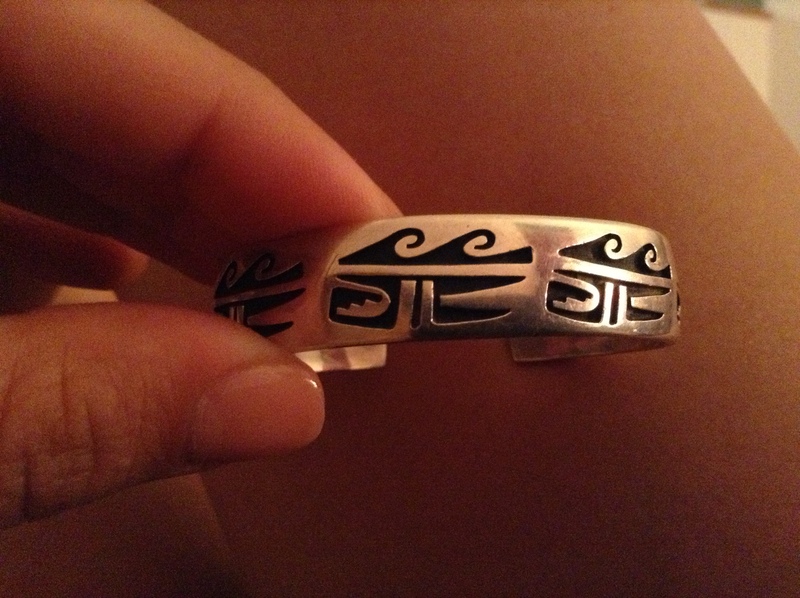 What is the significance of my Hopi bracelet? My name is Chelsea and I had a few questions about a Hopi overlay bracelet I got as a gift a few years ago. I have been trying to research what the different symbols mean and exactly who the artist is. There is a capital “T” outlined next to the word sterling. The capital T is not filled. On the bracelet, there are waves across the top with another symbol underneath lining the bracelet that I have not been able to find anywhere online. I never take the bracelet off and it is important to me to figure out what it all means. The thick T that is not filled in is actually an antelope rattle, the hallmark of Hopi artist Floyd Namingha Lomakuyvaya of the Strap Clan in the village of Shungopavi. He learned from Kenneth Kuwanvayouma and started producing in 1973. I can see why you are wearing this bracelet every day – it is beautiful. As far as the symbolism, Hopi designs can be quite stylized. The waves are pretty certainly there to represent water. As far as the bottom portion of the design, I think it is half of a badger paw but I am not sure. Perhaps others might chime in as to what the lower half of the design represents. Hope you can answer a question for me. I was in Santa Fee (years ago) and during the open market I purchased a sterling silver cuff bracelet from I thought the artist Roderick Torino. 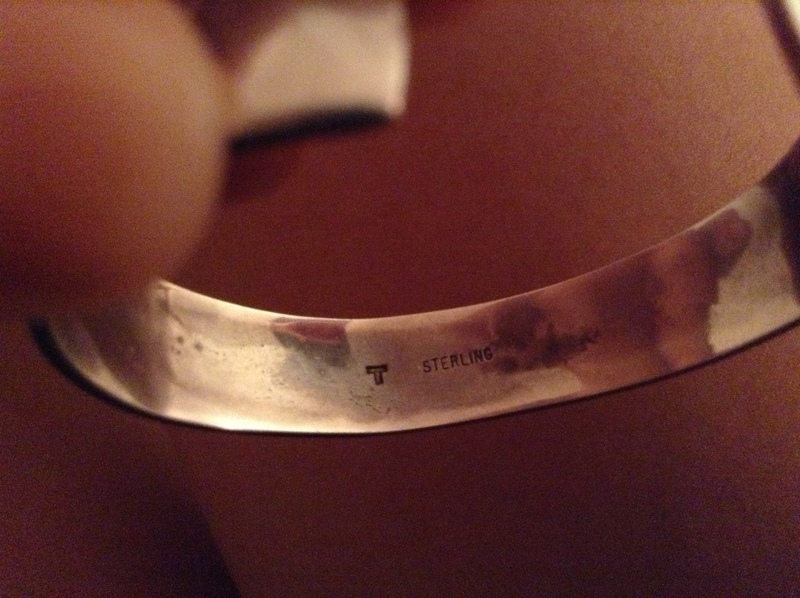 It is stamped sterling with RMT and a symbol like a loop with 2 lines across it. Is this his jewelry? What is the difference between the half-moon R and the one I have? Does this mean he didn’t make it? First of all, it is Roderick Tenorio, a Kewa (Santo Domingo Pueblo) artist who shares the hallmark with his wife Marilyn. The hallmark you show is their hallmark. When a piece also has the half moon and the R, it is an additional mark to indicate it is from the shop “Relios” which is now Carolyn Pollack Sterling Silver jewelry. That group of hallmarks were on the bracelet in our pawn shop which is probably how you found us and why you wrote us.